The property's previous owner said the 23-pound hunk of iron and nickel landed in his backyard in the 1930s. GRAND RAPIDS, Mich. – A Michigan man curious about a rock he’d used for decades as a doorstop now knows its secret: it’s a meteorite worth $100,000. In fact, the nearly 23-pound hunk of iron and nickel is the sixth largest meteorite found in Michigan, according to the Smithsonian Museum and Central Michigan University. David Mazurek said he took his doorstop to the university for examination after seeing reports in January of meteorite pieces selling for thousands of dollars. “I said, ‘Wait a minute. I wonder how much mine is worth,”‘ Mazurek said. 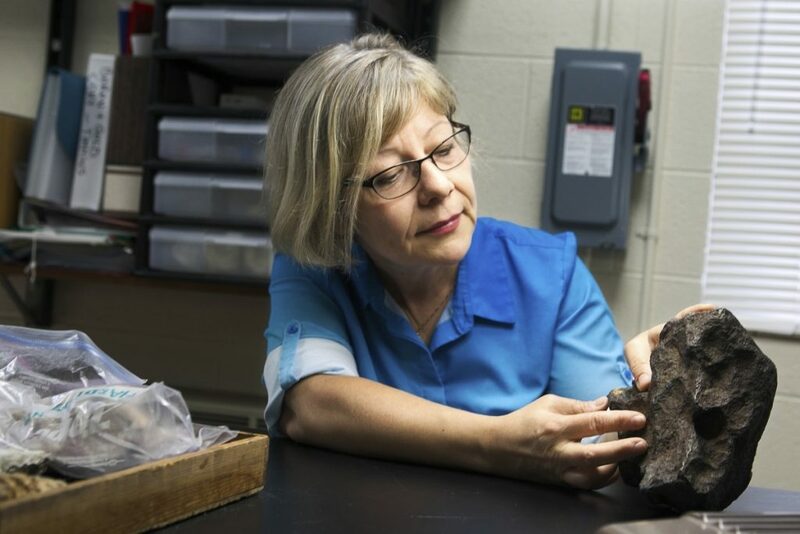 University Geology Professor Mona Sirbescu first identified the piece as more than just a rock. She then sent two small slices of the rock to the Smithsonian for confirmation. Mazurek said the meteorite came with a barn he bought in 1988 in Edmore. He said the farmer who sold him the property told him it landed in his backyard in the 1930s. More tests are being conducted to see if the meteorite contains rare elements. “What typically happens with these at this point is that meteorites can either be sold and shown in a museum or sold to collectors and sellers looking to make a profit,” Sirbescu said. The Smithsonian and a mineral museum in Maine are considering purchasing the specimen. Mazurek said that when he sells the meteorite, he’ll donate some of the money to the university.